Our Age 3-4 Preschool Curriculum Package includes 38 weeks of themed printable preschool lesson plans and instructional activities that are progressive in nature, increasing in challenge with each week and is designed to be a complete-year program for preschool. Used in homeschools, home child care settings and traditional preschools. In addition to our core 30 weeks, this program offers 8 additional optional seasonal units for 38 weeks total instruction. The 8th seasonal unit "Santa's Workshop" is a BONUS unit coming Winter 2017 at no additional charge. Get ready to have a ton of FUN!! 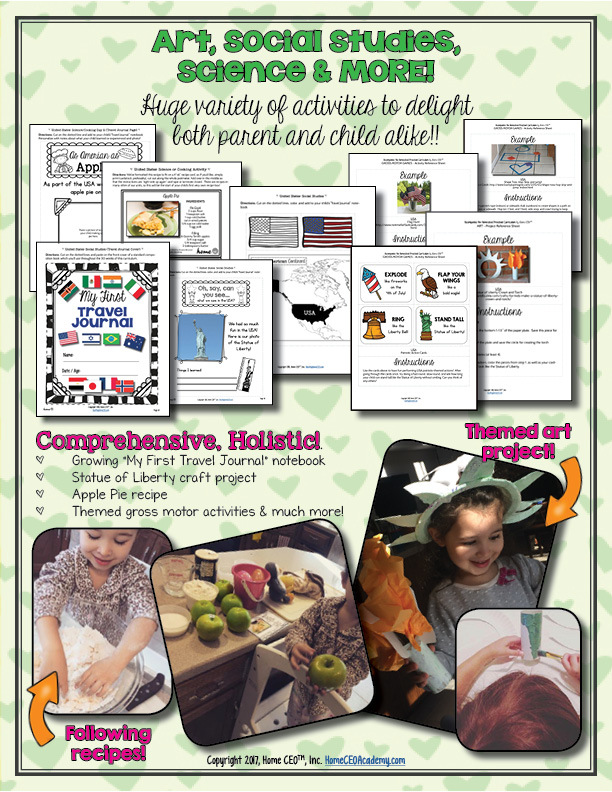 This is an entire preschool program, with all the related printables & matching classroom decor and organization elements, to implement side by side with your children as a parent teacher. This is a large, holistic and all-encompassing preschool curriculum program with weekly themed units that are flexible but structured. For homeschoolers, this is perfect for the parent who wants to be a parent teacher and strengthen their parent-child interaction and relationship bond through easy and fun educational play. 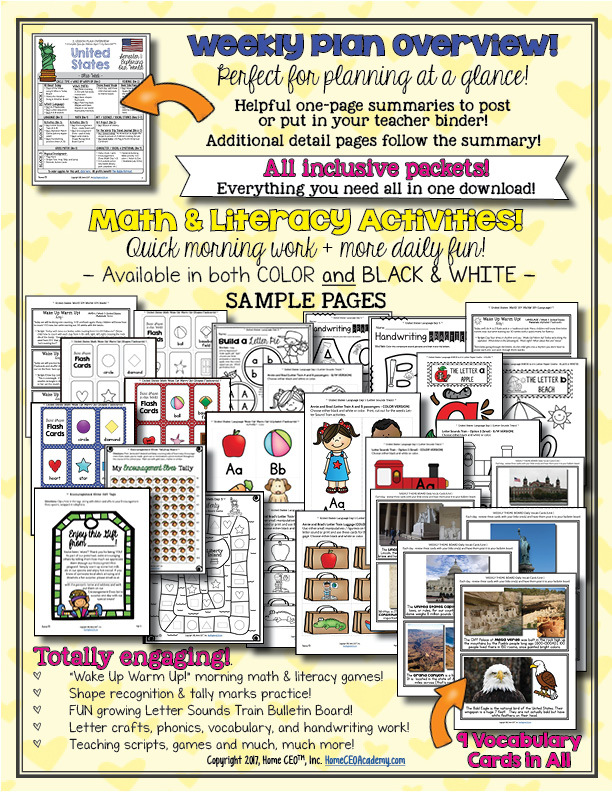 This material is interesting for teachers and homeschool parents too! 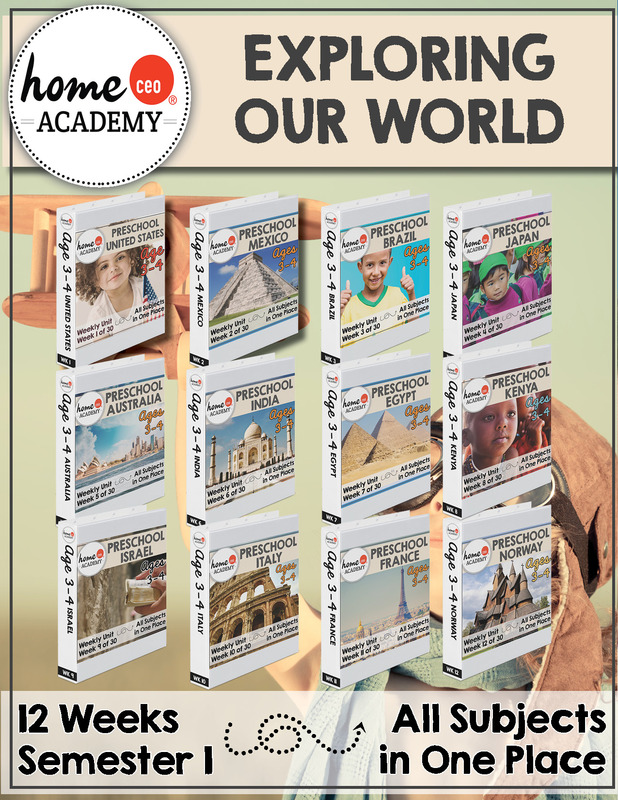 You'll be engaging in interesting conversations about the world in which we live through our book selections, weekly vocabulary cards full of fascinating facts and our many themed weekly activities. This complete year preschool program and its weekly units cover EVERYTHING, thereby eliminating the need to piece together multiple programs and adapt to several organizational systems. Instead, each streamlined unit has language arts, math, social studies, life science, gross motor / physical activities and art all in one place. Everything is progressively challenging through the course of the program, so your child will always be growing. Semester 1 we do cooking activities in lieu of the science block to enjoy the flavors of the world. We also include a service learning component for social and emotional learning. These 30 weekly thematic units can be used with a calendar year (January to December) preschool program OR an academic year program (August to May). Or simply follow the months in sequence and start any time! 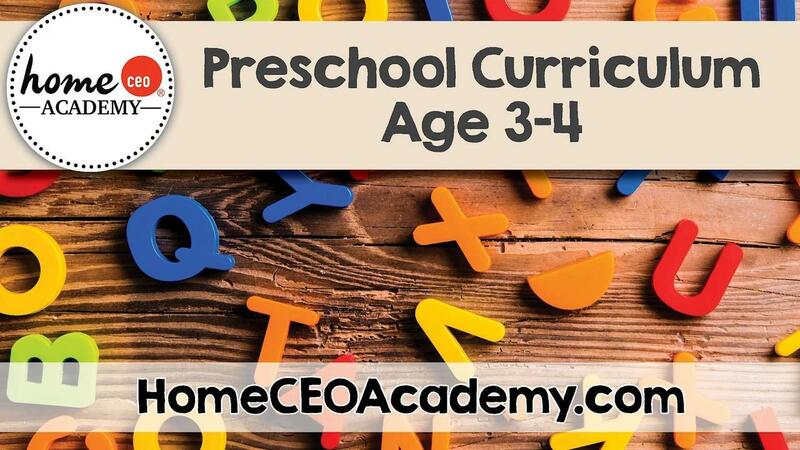 The Home CEO Age 3-4 Preschool Curriculum is a HUGE, HOLISTIC and SIMPLE preschool program. 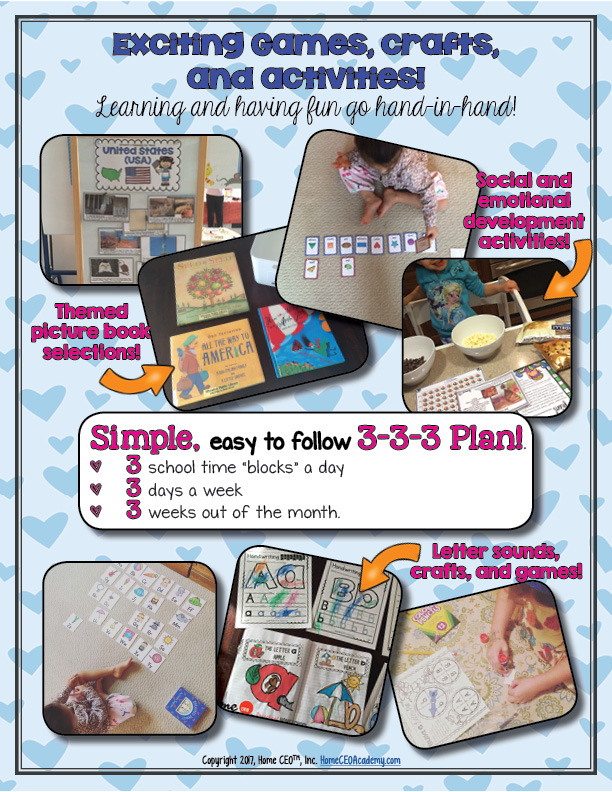 30 weeks (plus 8 optional seasonal units) of themed preschool lesson plans and materials (for 38 weeks, total). Monthly preschool planning schedule and binder covers to get you completely organized. Weekly overviews/orientations with pictures showing our units in action. BONUS Thanksgiving, Christmas, Easter, Valentine's Day, St. Patrick's Day, Fourth of July, Santa's Workshop and May Flowers Seasonal Units. 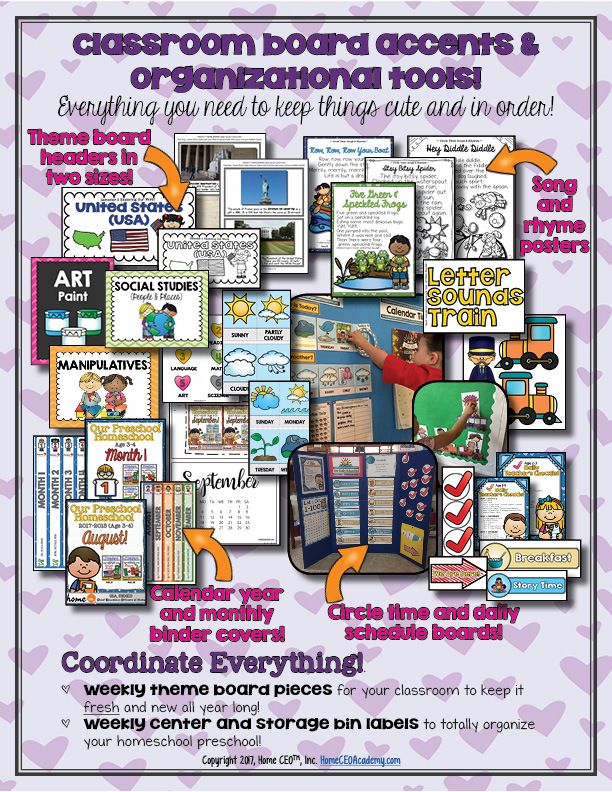 Supporting materials and printables including flashcards, visual aids, worksheets and much much more! WHAT ARE PEOPLE ARE SAYING ABOUT OUR CURRICULUM? 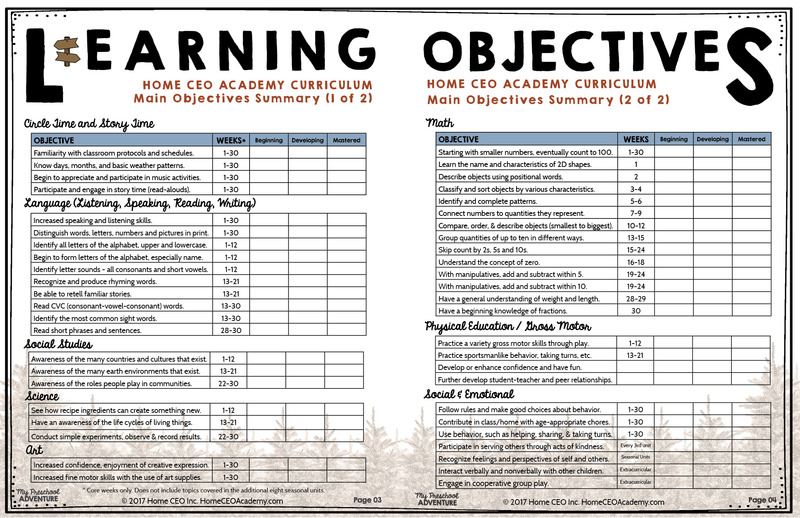 When you purchase our printable program, you receive 30 weeks of core curriculum, plus 8 additional seasonal units. All 30 core units in our preschool curriculum have continuously progressing skills and cover language, math, social studies, art, gross motor and reading activities. The following are sample pages from one of the 38 units. 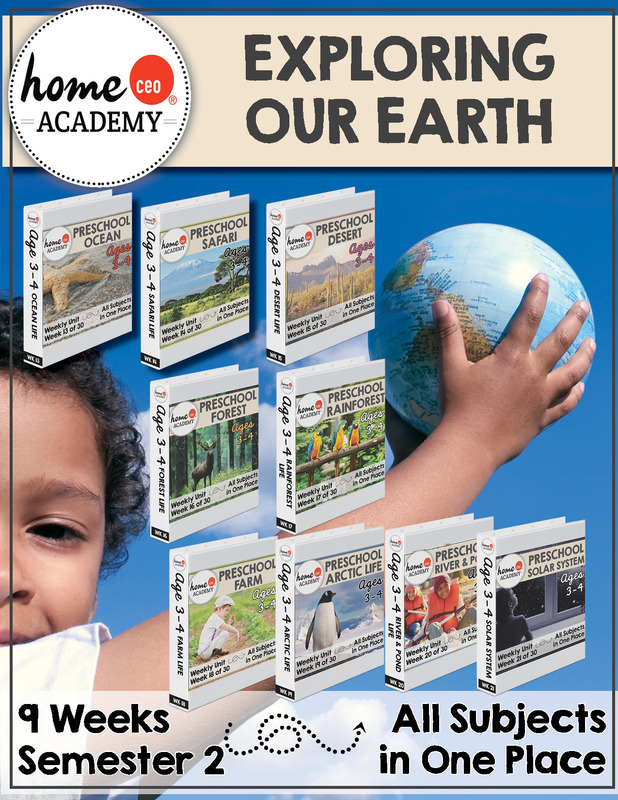 Lifetime access to our Age 4 curriculum library, customer support, and all downloadable printables is two payments of $45 or a single payment of $80. This equates to about $2.10 a week - less than a cup of coffee! All monthly profits from Home CEO Academy are distributed to over 30 charitable humanitarian organizations who are making the world a better place in the area of children, education, poverty, homelessness, human trafficking, and more. Most recently, in May 2017, thanks to our customers, we also sponsored the build of a playground at a primary school in Uganda, in partnership with East Africa Playgrounds! When you purchase our program, you have ongoing access to customer support. Call or email us at anytime during your school year if you have questions. We respond within 24 hours and are dedicated to helping you succeed. I'm Interested and Want to Learn More! Does this sound like an exciting program for both you and your little ones? Then sign up today! Questions? We are known for our friendly, responsive support! Email us at support@homeceoacademy.com or call us today at 877-853-1552. Single payment for instant access and lifetime updates. For families purchasing in the United States. Two easy payments of $45 (for $90 total). Instant access. For preschools and families purchasing in the United States. 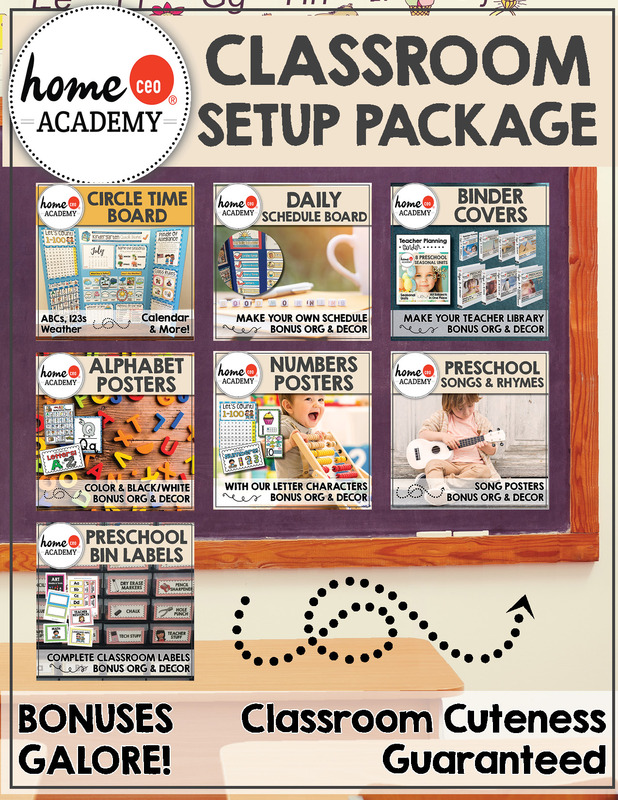 Our Buy The Store Lifetime Membership includes all curriculum items in the store. 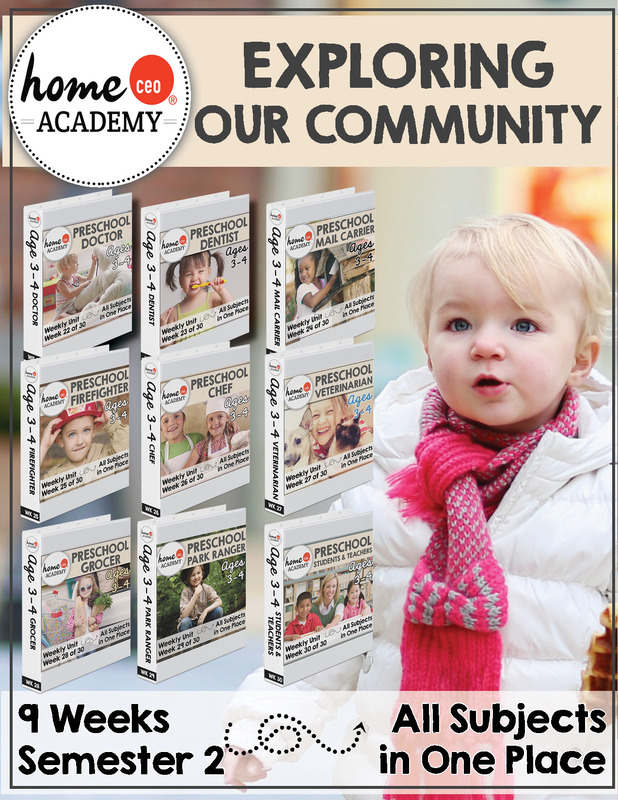 This includes the Age 2-3 program (46 weeks), Age 3-4 (38 weeks), and Kindergarten programs (36 weeks growing bundle), seasonal units, supplement packs and any/all future curriculum packs. With the exception of the alphabet clipart, added as a bonus, this pack does not include the clipart sets from our separate Clipart That Cares store. Single payment for families purchasing from Australia (AUD - Australian Dollars). Single payment for families purchasing in CAN (Canadian Dollars).